New York offers many options for those seeking treatment for a substance abuse disorder. From prevention initiations to private drug rehab facilities, New York is a place where you or a loved one can receive comprehensive and personalized care while recovering from a drug or alcohol addiction. 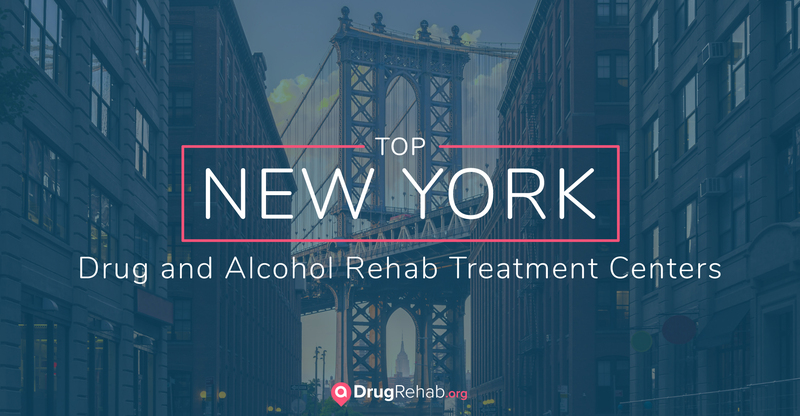 We have put together a list of the best rehab centers in New York based on their success rates, reviews, reputation, and accreditation. These treatment centers have paved the way to a brighter future for many New York residents. The Renaissance Project is a 100-bed residential addiction treatment center in Ellenville, NY. It is a non-profit facility that works with adult men and women. Patients without insurance fees are billed on a sliding scale based on family income and the family’s ability to pay. For some, all fees are waived and the care is free. This treatment center offers long-term and residential care. They also offer treatment for those with dual diagnoses (co-occurring mental and substance abuse disorders), as well as groups for those dealing with the criminal justice system. The Retreat is a luxurious and extremely private facility in Westchester County. Each patient has a private room. Treatment is tailored to individual needs and upon discharge, patients are given a detailed outpatient plan of treatment. For those needing detoxification services, they are available at Columbia University Hospital. Fees are either self-pay or private insurance. This Harlem-based community drug treatment center offers affordable or free drug and alcohol rehabilitation to men and women. Its primary focus is on women and men who are homeless. Striver House offers holistic based programming for 9 to 12 months in a program that included resocialization. Striver House is a 60-bed facility and offers a drug-free environment that promotes freedom from homelessness and drug and alcohol abuse. This center offers individualized, client-centered treatment as well as group and family counseling and vocational and education training. The Dunes is a luxury 4-acre estate located in East Hampton, NY. The facility offers private bedrooms with a private bath, gourmet meals, great outdoor space, and daily activities. Programs include inpatient, intensive outpatient, and aftercare. Self-pay and private insurance are the two methods of payment accepted. The Dunes offers custom and individualized treatment that can include spiritual reawakening, behavior-focused therapy, behavior addiction treatment, and physical rejuvenation. Their personal attention and focus on each client is one of the many factors that sets The Dunes apart from other treatment facilities. Phoenix House is a treatment center with multiple locations throughout New York that has helped thousands of individuals reclaim their lives from substance abuse disorders. They provide a range of services that include prevention, intervention, and treatment as well as aftercare and support throughout recovery. Phoenix House also provides treatment for patients with dual diagnoses as well as military personnel, veterans and families of veterans, and medication-based treatment. They have locations in Brentwood, Brooklyn, East Hampton, Hauppauge, Lake Ronkonkoma, and Long Island City. Arms Acres in Carmel, New York, is a private treatment center that provides rehab programs for those suffering from substance abuse disorders as well as co-occurring mental health and medical disorders. Arm Acres offers both inpatient and outpatient programs that are patient-centered and individualized. This treatment facility focuses on spiritual, mental, and physical rehabilitation and aims at providing individuals with the tools needed to lead a meaningful and fulfilling life. They utilize the principles of Alcoholics Anonymous and Narcotics Anonymous throughout their programs. Before a patient starts a treatment program, it may be necessary that he or she goes through a detox program to safely and efficiently rid the body of drugs or alcohol. With detoxing comes symptoms of withdrawal, which can be painful and uncomfortable to go through. Additionally, when detoxing from alcohol, opioids, or benzodiazepines, the symptoms can be life-threatening, so being under medical care is imperative to ensure a smooth and safe detoxification. If you are physically dependent on any drug or alcohol, it’s important to attend a medically assisted detox program before entering a treatment program. These detox programs can provide support as well as any needed medical assistance throughout the detox process so you can be on your way to a safe recovery. Arms Acres offers medically supervised detoxification programs where patients can receive comfortable and personalized treatment while detoxing from chemical dependence. This treatment center also offers inpatient programs, so the transition from detoxification to long-term treatment is a convenient process. Inpatient drug and alcohol treatment centers are places that patients can reside for a certain amount of time to receive treatment for substance abuse disorders. An inpatient facility provides individuals with a safe and positive environment that is free from temptation and enables them to form new and healthy habits and ways of life. Some New York treatment facilities rely on an overarching program to provide comprehensive treatment, such as a 12-step program or gender-specific program. Many New York inpatient treatment centers, such as Arms Acres, incorporate a 12-step program into their treatment methods. This type of program is based on the belief that addiction is a disease that is outside the control of the individual and a reliance on a higher power. Other New York treatment centers offer treatment that is based on a non-12-step method. This method also treats addiction as a disease and uses scientific foundations to treat the individual suffering. There are also treatment facilities in New York that offer gender-specific programs. These programs typically provide a gender-specific environment that caters to each gender individually and provides treatment that focuses on issues unique to each gender. Phoenix House, which has various locations throughout New York, offers gender-specific, research-tested programs that address various issues, including parenting, anger management, and relapse prevention. Oftentimes, men and women face different issues when seeking treatment. For example, women often deal with problems that revolve around motherhood, self-esteem, and even domestic abuse. On the other hand, men can struggle with expressing and coping with their emotions as well as unwanted aggression. A gender-specific program caters to these unique issues that women and men face that are sometimes not addressed when attending a coed treatment center. There are many facilities in New York that offer treatment for co-occurring disorders, or a combination of a substance abuse disorder and mental health disorder. Dual diagnosis treatment is used to addressed all aspects of co-occurring disorders to help the patient recover mentally, physically, and emotionally. New York Center for Living offers inpatient assessment and prevention programs for adolescents, young adults, and families coping with co-occurring disorders. This facility utilizes evidenced-based therapies as well as 12-step programs to get patients on the road to recovery in a safe and therapeutic environment. They also provide art therapy, yoga, nutrition support, and group therapy for individuals and families. The time a patient spends at an inpatient facility can vary based on their unique needs. Facilities also sometimes offer treatment programs that are a set amount of time. For example, a New York inpatient program may be 30 or 60 days and can even from 90-120 days for longer-term treatment. Programs that are shorter, such as 30 and 60-day programs, are often much higher in intensity and consist of many daily group or individual therapy sessions that may incorporate cognitive-behavioral methods. The goal is to provide understanding into an individual’s substance abuse disorder as well as methods for preventing relapse once the individual returns to normal life. Programs that are longer in length generally offer more comprehensive and lasting treatment. Long-term New York treatment programs also provide individuals with the opportunity to get out of an often unhealthy environment that was contributing to their substance abuse in the first place. By living in a therapeutic and supportive environment for an extended period of time, the patient can heal and learn the steps they can take to prevent returning to his or her previous lifestyle. Outpatient drug and alcohol centers in New York provide substance abuse treatment while the patient resides at home. Outpatient treatment can also be used to transition the patient back into everyday life after completing inpatient treatment. Sometimes, outpatient treatment is the only option for those with other obligations such as work and children. While receiving any form of substance abuse treatment is helpful, it’s important to know that remaining at home while getting help can be much harder than an inpatient program. Oftentimes, it’s the individual’s environment that encourages or contributes alcohol or drug abuse. Remaining in this environment can make it difficult to truly recover from a substance abuse disorder due to daily challenges the patient may face at home. Sometimes, the thought of paying for inpatient substance abuse treatment can be enough to turn someone away from seeking help. However, there are numerous options available to those who may not be able to pay for treatment. New York inpatient treatment centers often offer a variety of payment options and accept many types of private insurances. If you work for a company that has 50 or more employees, the Mental Health Parity and Addiction Equity Act of 2008 ensures that the group insurance plans available to you cover substance abuse and mental health treatment programs. Additionally, plans offered by the Health Insurance Marketplace offer coverage for mental health treatment. Some New York treatment facilities also except federally funded insurance programs such as Medicaid and Medicare. Treatment centers may also provide payment plan options in addition to scholarships or grants to help offset the cost of a program. The Office of Alcoholism and Substance Abuse Services (OASAS) in New York helps those who are struggling with a substance abuse disorder receive treatment even if they are unable to pay the full price. OASAS also offers support for individuals who have problems with their insurance. There are many treatment facilities throughout New York that provide treatment for patients who are struggling financially, and may offer payment plans based on a sliding scale that is determined by income. The Bronx and South Beach are just a few places where OASAS treatment centers are located. While prescription medication and illicit drugs such as heroin are part of the substance abuse crisis in New York State so is alcohol abuse. Many of the techniques used in treating prescription medicine and illicit drug abuse are also used for the treatment of those who abuse alcohol. In New York, there were 825 heroin deaths in the state in 2014. This represents a steep increase over the prior year of 24% or 159 more deaths than in 2013 and almost 25 times the amount of heroin deaths reported in NYS a decade earlier. According to the federal Substance Abuse and Mental Health Services Administration (SAMHSA), about 75,000 New Yorkers annually have used heroin from 2013 through 2014. This accounts for roughly 10% of all heroin users in the United States. In addition, the rate of heroin deaths due to overdose has exceeded or equaled the national rate each year since 2006. It ranked 19th among the 43 states for which there was available data. Heroin use in NYS relates to a marked increase in legitimately prescribed pain medication. People that take pain medication often believe that if one pill makes them feel good, two will make them feel better. As their doctors cut them off from pain meds, the cost of obtaining them illegally rises. Eventually, the accidental addict turns to heroin as it is cheaper than, and more easily obtainable than, prescription painkillers. Alcohol continues to be a problem in NYS, as data from 12 counties underscores. The duplicate percentages are not typos, there are ties for the ranking of the 12 worst counties for 1st, 2nd, and 3rd place.